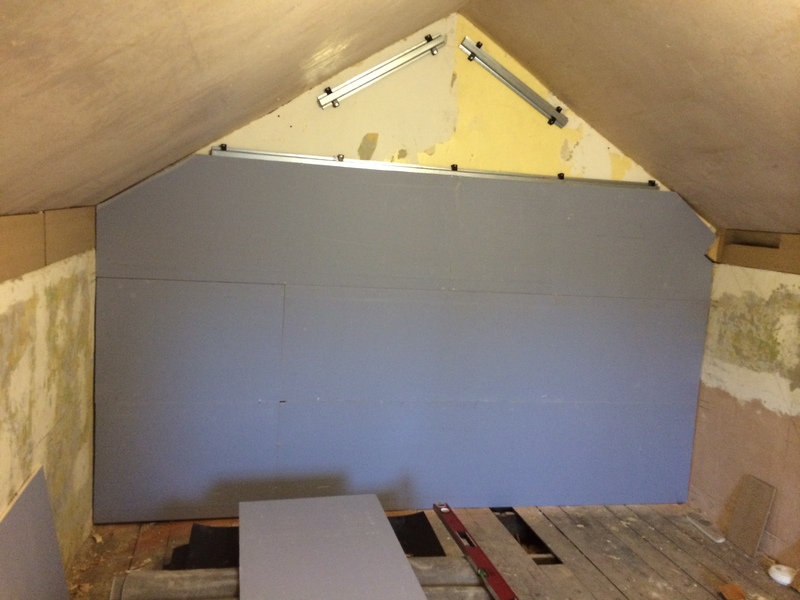 Recently one of our customers sent through pictures they took while they were completing a soundproofing installation and he has given us permission to use the images as a guide on how to install this great and yet very simple soundproofing system. 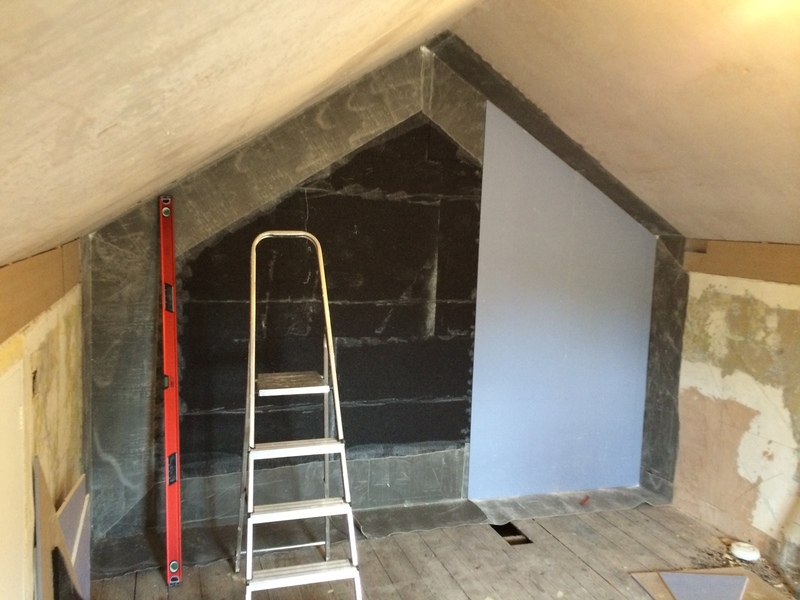 To give you a little bit of background this installation is for a home cinema build in an already converted attic. The owner was concerned with disturbing people next door even though the house is an old build and very solid. There is a neighbours bedroom on the other side of the wall and he didn’t want to have to worry about making too much noise when watching films particularly at night. 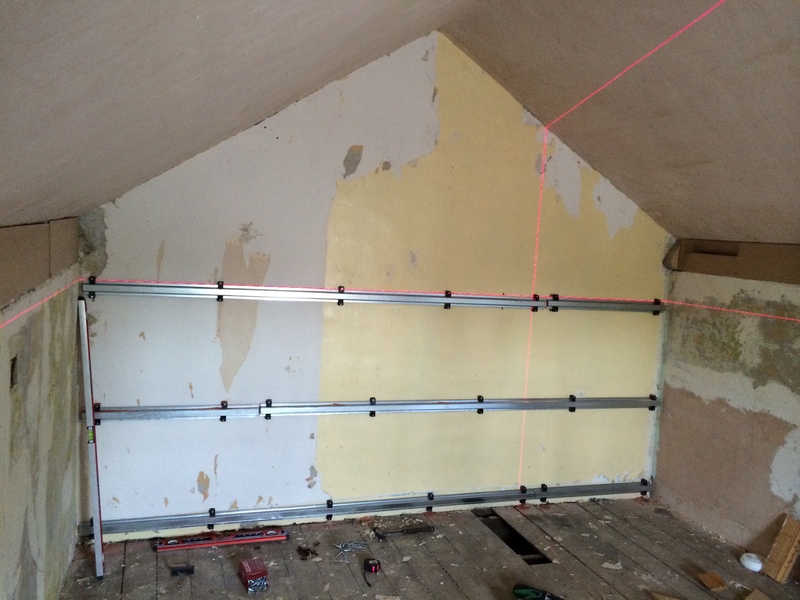 So the customer gave us a call for advice on the best way to proceed and he decided to go ahead with our recommendations of the SoundSense Isolation System which is a resilient bar system with a difference. 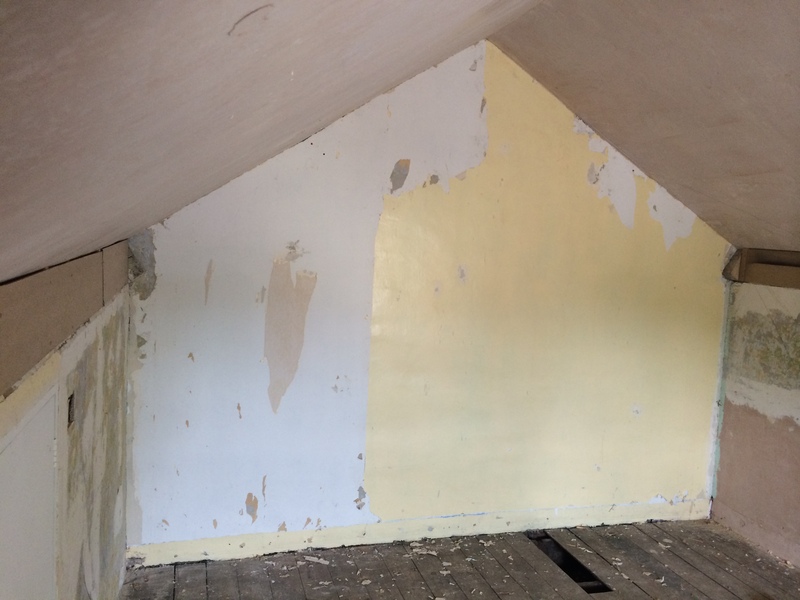 First of all he stripped back all the wallpaper in the room getting back to the bare plaster and floorboards. Eventually he will be soundproofing the other walls with a different system and will be building a floating floor but for now we are concentrating on the wall that joins this room and the neighbours bedroom. Once the wallpaper was all stripped the wall was ready for fitting the SoundSense Isolation Bars and Clips. On this occasion he has fixed the clips directly to the brick wall as his aim was to save as much space as possible. Fixing the clips straight to masonry or concrete is fine as is fixing the clips to timber studs or ceiling joists. When you are fixing the clips to timber studs they need to be fixed at 90 degrees to the wall studding. In all cases the spacing between the channels should be a maximum of 600mm. The spacing of the clips on SoundSense Isolation Bar should be a maximum of 900mm. In this instance he has set both bar and the clips at 600mm centers. The required number of clips can be simply slid onto the bar and moved into position. The SoundSense Isolation Bars can be cut to length using a hacksaw or tin snips. The bottom row of channel should be a maximum of 75mm to the center of the channel from the floor. The top row should be within 150mm of the ceiling. 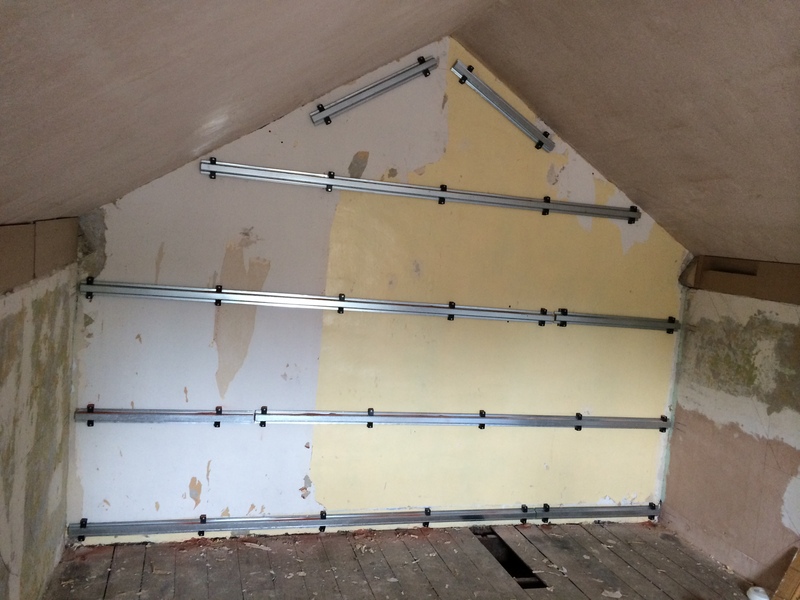 As the ceiling for this installation goes to a peak he decided to add 2 pieces of bar at the top so the plasterboard was fully supported. If you are fixing the bar and clips to wood you need to use 60mm coarse thread screws. If you are fixing to steel studs you need to use 42mm self-tapping screws. If you are fixing to masonry as in this installation you need to use 60mm anchors and orientate the bars horizontally. 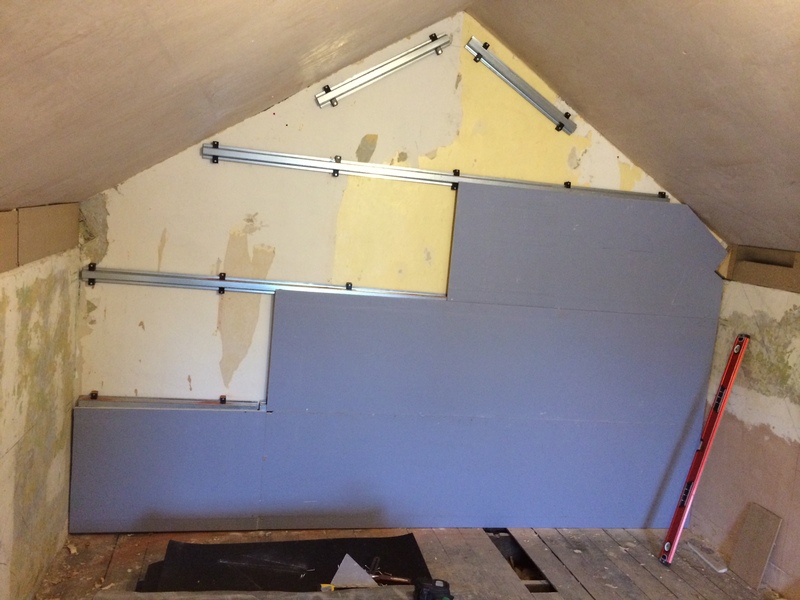 Once the SoundSense Isolation Bars and Clips are securely fixed the next step is to install the first layer of acoustic plasterboard. The first layer of acoustic plasterboard should be 19mm thick and you should align seams between sheets on the centreline of the horizontal channels as you can clearly see above. Ensure a gap is left around the linings the decouple the layer. Use the minimum number of drywall screws to fix the first layer of acoustic plasterboard to the bar so as to help avoid hitting screw heads when fixing the second plasterboard layer. 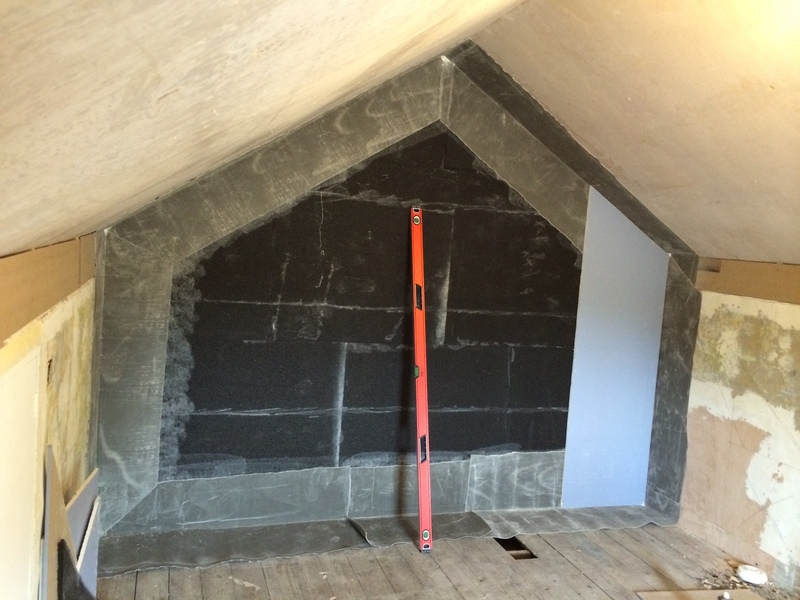 Make sure that no fixings connect the plasterboard lining to the joists, studding or masonry. For the first layer we recommend using 32mm self-drilling drywall screws. Understandably the customer wanted to take a belt and braces approach to this installation so before he completed the next step he decided he would seal the perimeter gap of acoustic plasterboard with acoustic sealant. 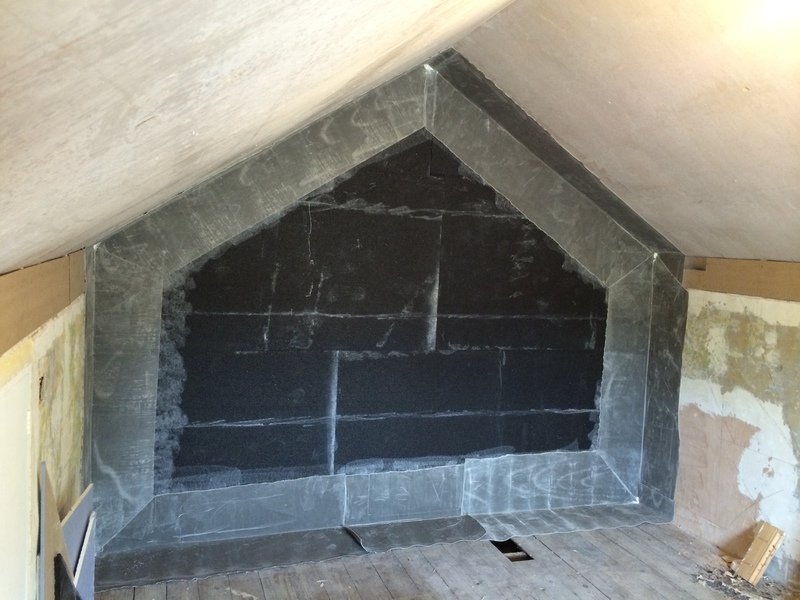 To improve the acoustic integrity of the system a double layer of acoustic plasterboard is required. 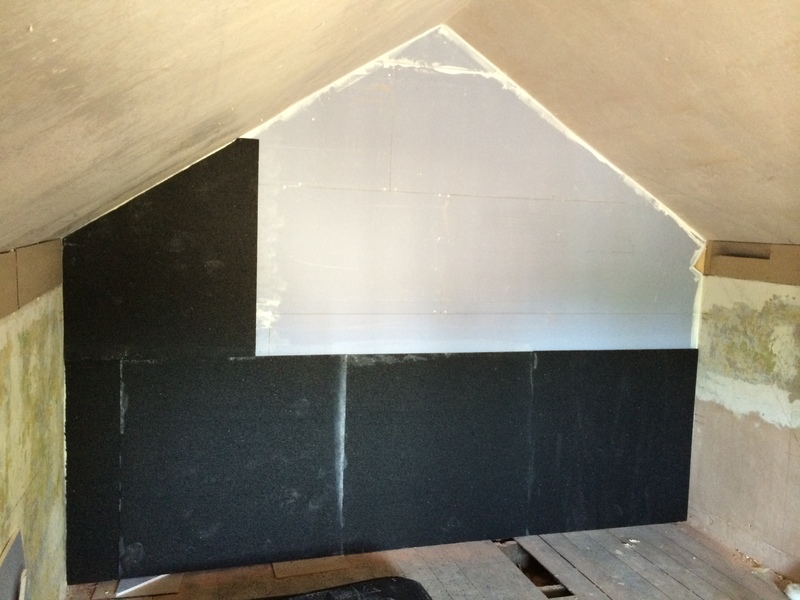 Before fixing a second layer of acoustic plasterboard we would also recommend installing one or two layers of Advanced Acoustics 2mm Soundproofing Mat. 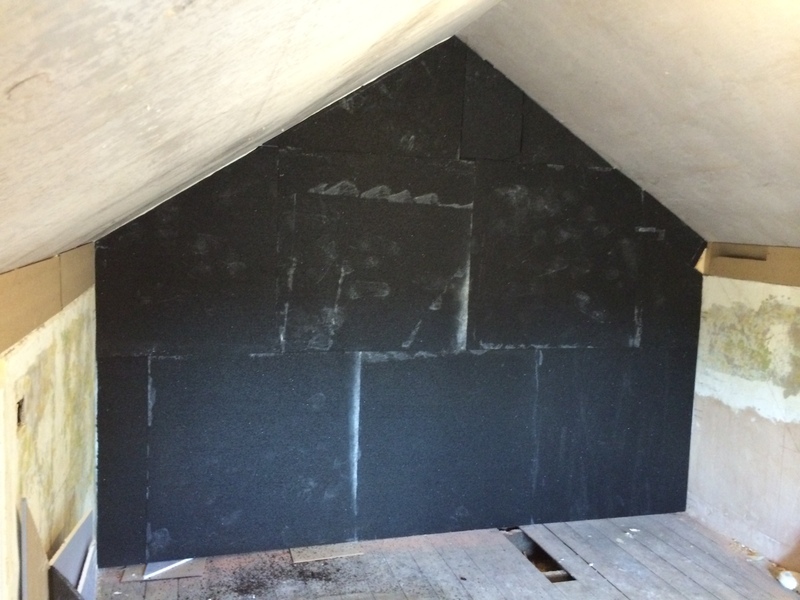 If a very high sound isolation is required you can use the Advanced Acoustics M20 20mm Soundproofing Mat which is what has been used for this installation. Whichever you opt for you simply glue the Soundproofing Mat to the plasterboard using our contact adhesive ensuring there are no gaps. It is good practice to stagger the joints whenever possible even with the Soundproofing Mat. It is also a good idea to protect against flanking noise. 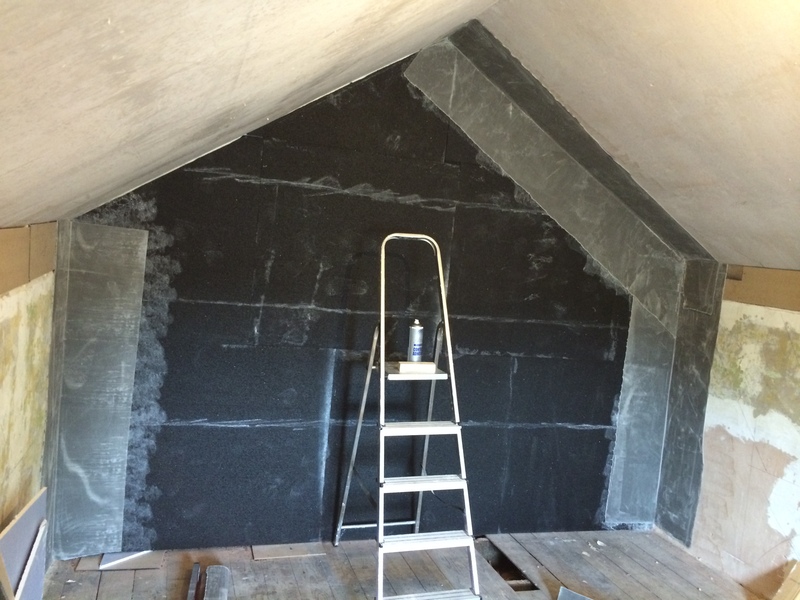 Our customer has done this folding the 2mm Soundproofing Mat down the corners. 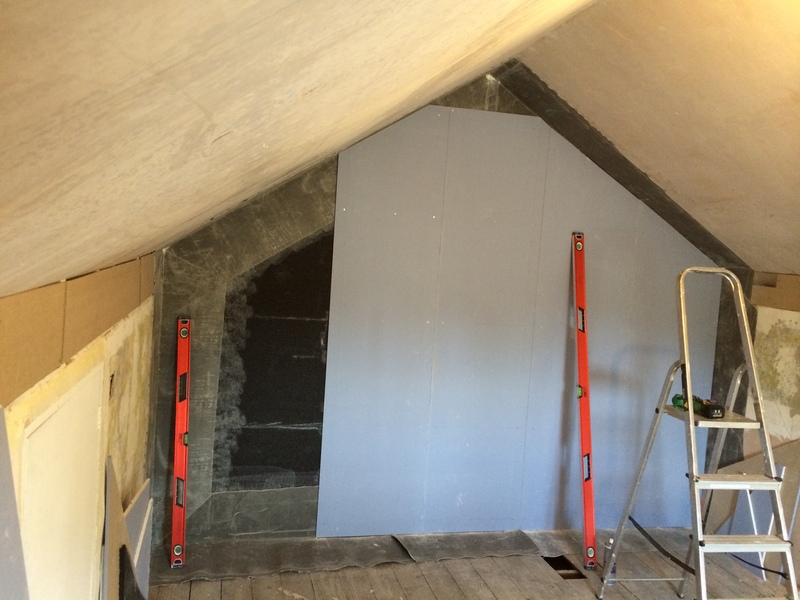 As we have previously mentioned he will eventually be soundproofing the other walls as well as the floors so he has taken this opportunity now before he fits the final layer of plasterboard and it’s to late. He has done the same for the bottom of the wall in preparation for the installation of the floating floor. 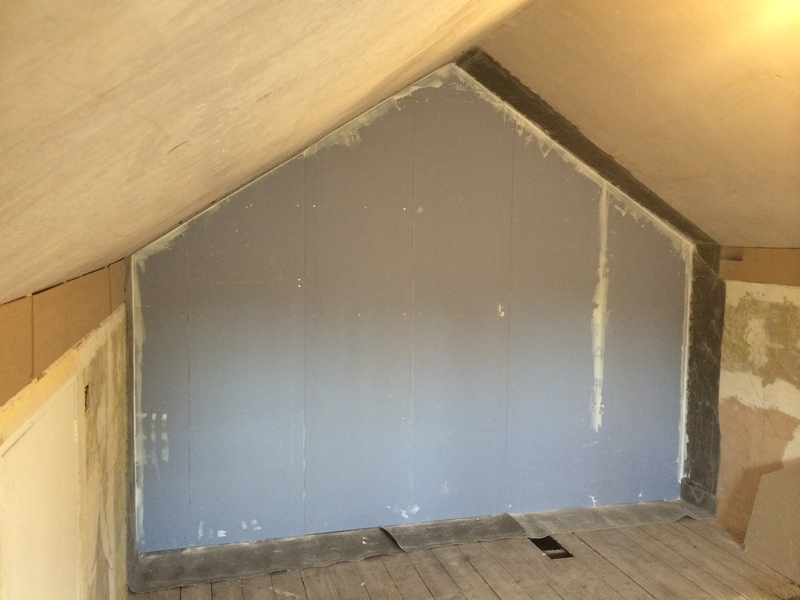 The second and final layer of acoustic plasterboard can now be installed. This should be 12.5mm acoustic plasterboard and should be fixed in a brick bond fashion again avoiding overlapping joints with the first layer and the soundproofing mat. The customer wanted to make as few holes as possible in the M20 Soundproofng Mat so he used as few screws as he felt he could. Again the correct length of self-drilling drywall screws should be used to avoid contact with the studwork, joists, masonry or concrete. 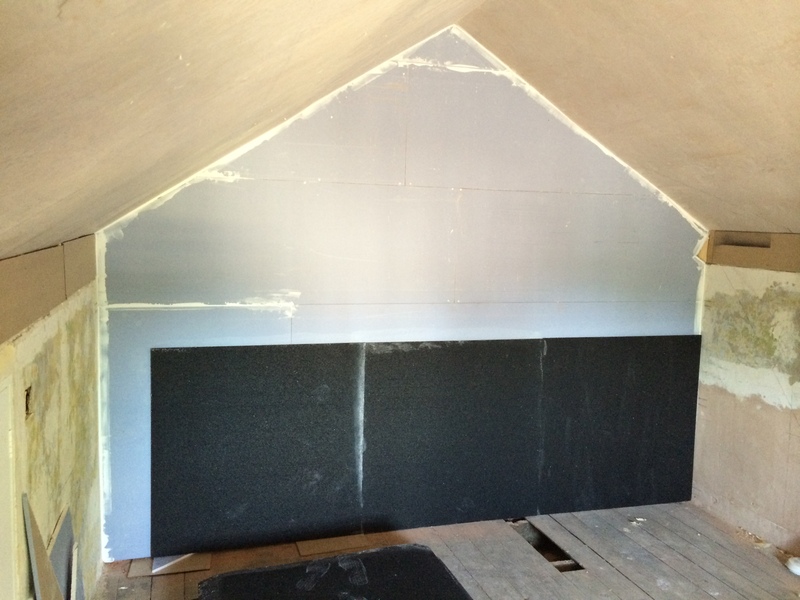 If you incorporate 1 or 2 layers of 2mm Soundproofing Mat you will need to use 42mm screws. If you are using M20 20mm Soundproofing Mat you need to use 65mm screws. 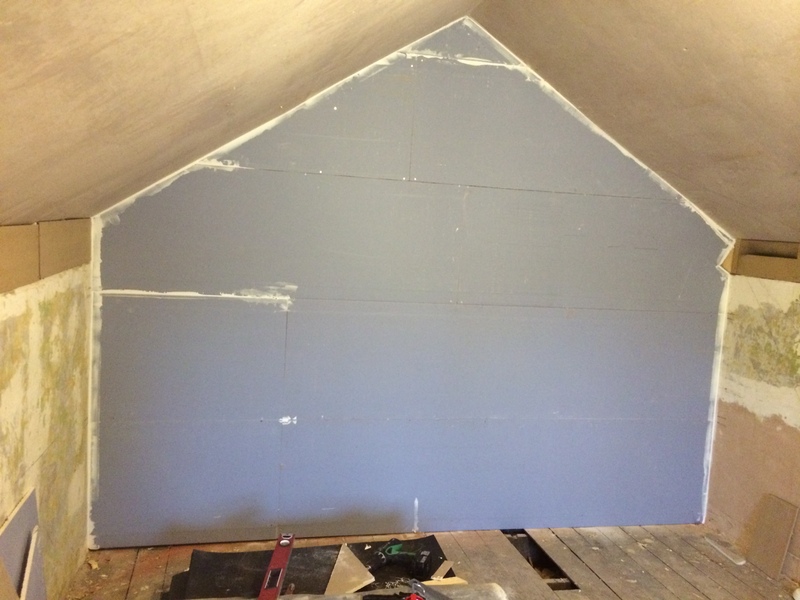 This customer was completing installation entirely on hos own so to make fixing the second layer easier he glued the plasterboard to the soundproofing mat as well as screwed it. This meant the plasterboard was held in place whilst gathering his tools and meant he didn’t have to use as many fixings. Foe the second layer of plasterboard again ensure there is a gap left around the linings so the system is fully floating. The perimeter gap can be filled with the acoustic sealant as our customer did previously. All potential sound leaks such as gaps around outlets, window or door frames, pipe penetrations and the like are sealed with a flexible, non-hardening acoustic sealant. Our customer completed this installation within 6 hours working completely on his own. While he has some DIY skills he has never plasterboarded or completed anything like this before. He said the installation was very easy to complete and the instructions we provided were clear and concise and he is really surprised at how easy it was to complete. His next step is to soundproof the floor by using the SoundSense Floor Isolation System. He has already begun work on lifting the floorboards and now the wall is soundproofed he doesn’t have to be so concerned with how much noise he makes during the build, the main reason he soundproofed this wall before any other surface. When our customer has complete the floor installation he hopes to send us images of that also for us to add to our site. If you would like more information regarding the SoundSense Isolation System or any of the other products mentioned on this article or any other products you have seen on our site then please don’t hesitate to get in touch with us by emailing us info@advancedacoustics-uk.com or by calling us on 01623 643609.